Thank you for interest in participating in this academic study which is focused on the Glasgow Apollo, and is being conducted as part of a PhD thesis which I’m currently undertaking at the University of Glasgow. 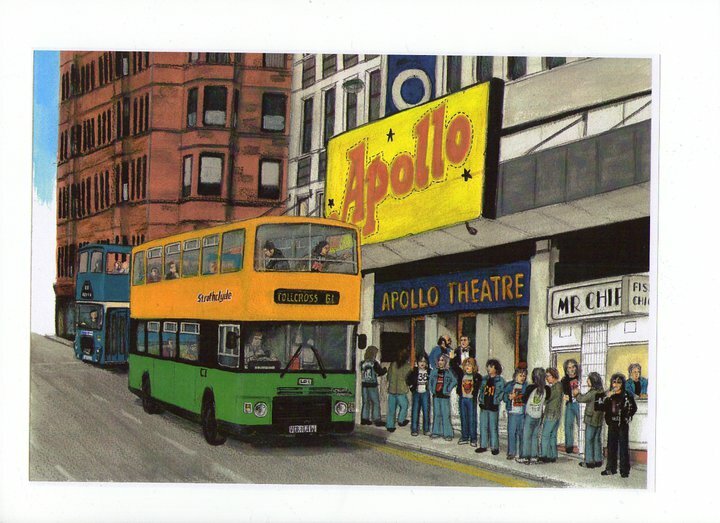 This part of the research aims to examine some of the factors that may have contributed towards the venue’s reputation, and your input will help to provide a clearer understanding of why the Apollo is still being referred to in such glowing terms nearly thirty years after it closed. The process for the Focus Groups would involve you taking part in a group discussion about aspects of the Apollo live experience. The Focus Groups, which will consist of between six and ten members, would last no more than two hours including sufficient breaks for the refreshments provided, and would take place in a central Glasgow location. At this stage it is planned to hold these events on selected Monday and Tuesday evenings between 7pm and 9pm from October 2012, with the venue location and relevant dates being advised in due course. Overall, your contribution towards the research process will be greatly appreciated and be of tremendous benefit to the study. If you are interested in participating in these Focus Groups, then please complete the short questionnaire here, which should take no more than 1-2 minutes to complete. Following receipt of this I will be in contact to let you know about any arrangements. Alternatively, if you do not want to participate in the Focus Groups for any reason, but would like to contribute to the study in some other way, such as answering some Apollo-related questions by email, then please contact me at k.forbes.1@research.gla.ac.uk – I would be delighted to hear from you.